Enhance connection and cooperation with weekly family meetings. Since we are meeting as a family each week to discuss the latest tool card, I thought it would be a good idea to choose the "Family Meeting" tool card this week. I think it is important to put some thought into how we format our family meetings. How we conduct our family meetings can make all the difference in the world as to how effective they will be. Dr. Jane Nelsen has a great article about Family Meetings on her website. From our first experience today, I can tell you that the first step (compliments and appreciations) is the most important. That really seems to set the tone for a positive atmosphere. In fact, my son was moved to tears when I gave him a compliment for being a good friend. Friday evening we attended a school play because he wanted to support his friends that were acting in the play. It turned out to be a great family activity and it was fun to see my son interacting with his friends. So even if you forget a step here and there as you conduct your family meetings...be sure and make it a point to start with the compliments and appreciations. I think the compliments are a must any time my family has tension. It also seems the worst around dinner and so we will do just the compliments parts to help us get through the night. It is always works well to have compliments first before correcting behaviors. I love family meetings. My 4 years old loves to decided who gets to give compliments first. This is something we started as soon as my son turned 4 - and it probably did more to change our household's prevailing default style to constructive problem solving than any other tool card. The compliments section was key - it was great to discover what our son appreciated about us, and certainly it was rewarding to see him beam when he heard compliments from us. (frankly, the compliments section even helped the tone between my husband and me!). After a few weeks we realized that it was also then a great blue print/skillset for solving issues during the week, and for brainstorming rules before new situations that resulted in better solutions and certainly greater buy in. 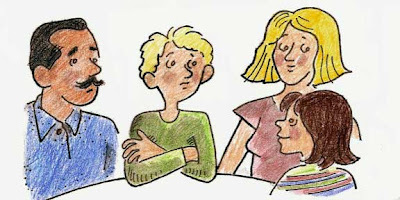 Just wondering how old children should be to start having family meetings?